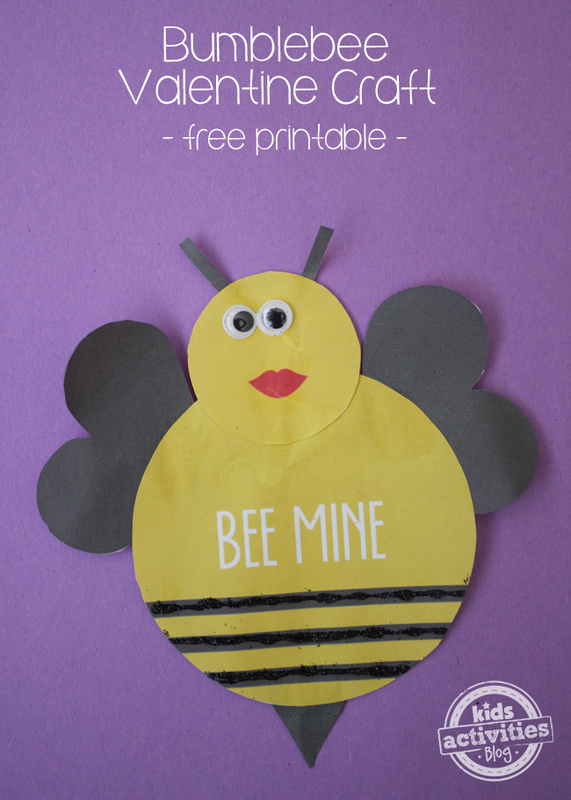 Valentine Craft Printable - Bee Mine! Make It With Your Little Valentine! You are here: Home / Fun Activities For Kids (By Age) / Free Printable “Bee Mine” Valentine Craft! 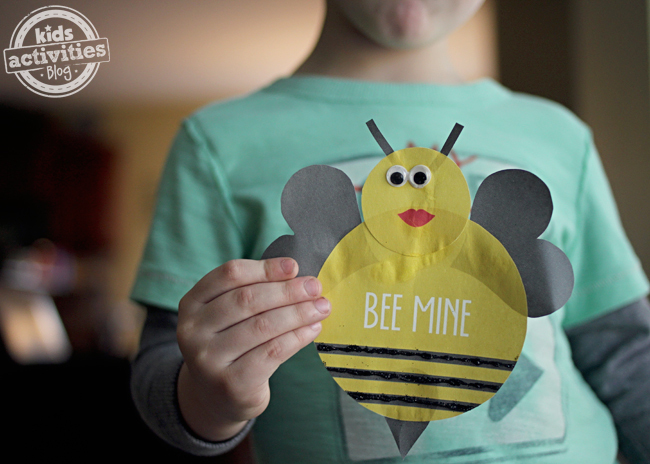 This Free Printable “Bee Mine” Valentine Craft is a fun and easy valentine craft for kids! By downloading our free printable bumblebee, the hard part is already done, leaving the fun for the kids. Create one bee, or make an entire hive of adorable Valentine bees, using this free printable template! To help your little one with this craft, just print the bumblebee and cut the pieces out. Older kids can even do this part themselves. By using a dab of glue here and there, piece the bee back together. We used this time to identify the different body parts of the bee. Don’t worry if the bee’s stripes aren’t exact, or his wings are a little off-kilter. That’s what makes each bee unique and so much fun to see when it’s completed. Once he is assembled, glue a couple of googly eyes on the top. No googly eyes? No problem! Just draw some eyes on with your markers! After we finished, we decided to add a little sparkle by adding some black glitter to his stripes. This part is entirely optional, so if you’re not a glitter fan, don’t worry about using it! Click here to download your free bumblebee bee valentine craft. It’s a great craft to use with your own kids when doing preschool at home or using with a class of kids in school. This printable is licensed for home and educational use, so feel free to use it with your students! Do you want to try another fun spin on this bumblebee valentine craft? Print out our free printable, and follow all of the steps above. Tear pieces of yellow and black tissue paper, and then crumple them into tiny balls to glue in place on the yellow and black areas of the bee for a 3-D effect! This is a great way to work on hand-eye coordination, and makes it easier for children who have a hard time cutting and might want a break from it. Plus, what kid doesn’t like tearing paper? It’s fun! To use felt, print our free printable onto cardstock, and then use it as a stencil. Trace the pieces onto yellow and black crafting felt, and then have the adult use a hot glue gun to glue the pieces together! 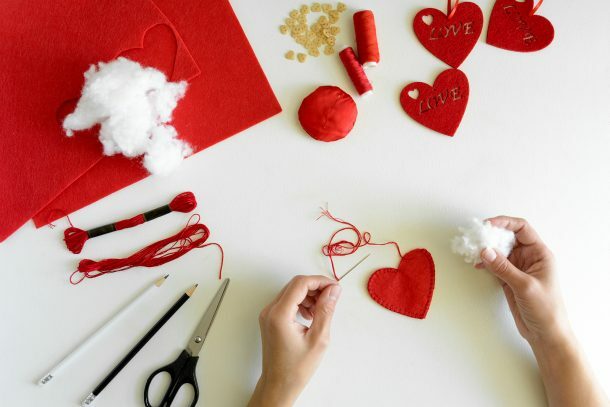 Making Valentine Crafts At Home Is Fun and Easy! Some of my favorite mommy memories, and hopefully my kids’ favorite memories, have come from crafting for different holidays, as a family. Valentine crafts are really special, because it’s the perfect time to talk about love with my little ones. 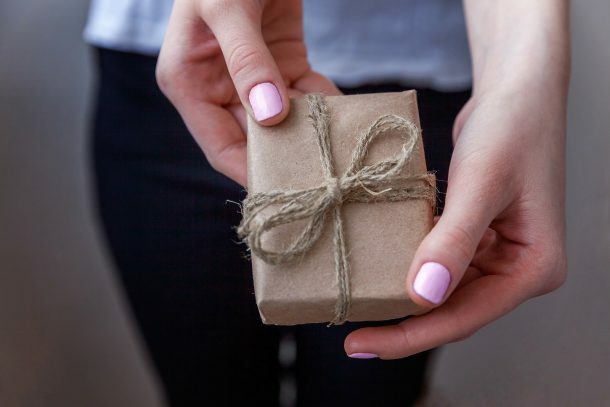 Leading by example, teaching them to care about the people around them, and to show it with a simple, heartfelt, handmade gesture… It’s beautiful. Such a fun craft. I loved doing things like this with my daughter when she was younger. Thanks for linking to the In and Out of the Kitchen Link Party. Hope to see you next week. This is adorable. I can’t wait to try this with the kids. How sweet! Thanks for sharing this cute idea. Thanks for sharing at Tell Me About It Tuesday! Thanks for joining the Weekend Wind Down Party! Please be sure to link to us in the future! We want to spread the word and be able to feature and pin great posts like this! Aww… super cute. Thanks for sharing via Family Fun Friday. Amazing! Thank you so much for ideas and inspiration.